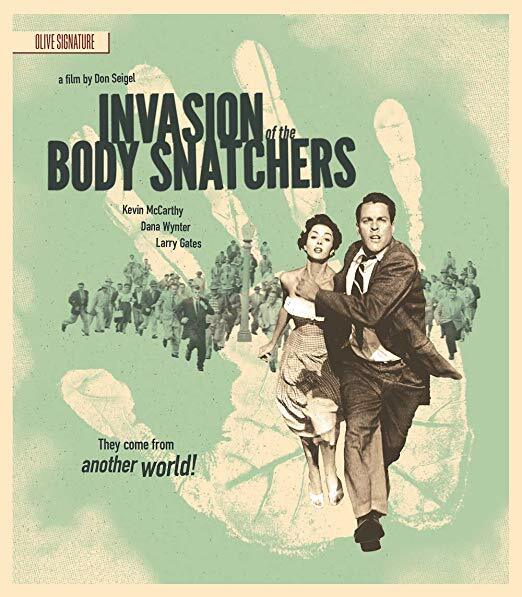 Don Siegel’s quintessential sci-fi classic, the 1956 Invasion of the Body Snatchers, is one of those films that once viewed, will not be forgotten. With ties to the real world, and politics galore, it’s up there with the sci-fi greats. Unfortunately, it was created during an unfortunate era in the world of cinema. Photographed open matte, presumably designed for projection in 1.85, it has ended up overly cropped, with seemingly no means of correcting the problem. How both an original negative, as well as a fine grain protection master, could both go missing is beyond me, but that’s the rumor. What remains is a 2:1 anamorphic image, presumably from a dupe printing negative, and for that generation, especially through an optical stage, it looks quite nice. Certainly as good as original SuperScope prints, which were 2:1. There were about twenty films that used variants of the process, inclusive of the least likely, Olivier’s King Henry the Fifth (1945, three-strip Technicolor, 1.37). Olive’s new Signature Edition release, is more about extras than the feature, which looks as nice as it possibly might. But it’s those extras which push this Olive edition into Criterion turf. As to the track, one can only wonder why the original Perspecta wasn’t included. I have the previous Blu-ray, but I won't upgrade until I see the pricing lower than it's currently at. If it gets down to $20 then I might bite on it for the bonus material. I've read the encoding is better on this BD release than the previous release. How both an original negative, as well as a fine grain protection master, could both go missing is beyond me, but that's the rumor. Obvious answer — it inserted itself into another movie's container and is hiding in plain site pretending to be a Navy Documentary on Personal Hygiene or maybe in the :Song of the South" canisters to go where nobody will ever look and be able to survive unmolested forever on the bottom shelf tucked safely away forever. Some invasions may not be limited to body snatching, alone. As to the track, one can only wonder why the original Perspecta wasn't included. How expensive is it to convert Perspecta to 3.0? What's the cost for 3D Film Archive to convert mono tracks to 3.0 (and they do a excellent job!)? Am a big fan of this movie. So already preordered it. Finally got around to reading the book it is based on. Was surprised to learn that the movie (even with its tacked on 'happy ending') is much darker than the original story. Deepdiscount – currently $21.99 + $1.99 shipping (unless you add something to get at/above $25 for free shipping). No sales tax for many locations. Don Siegel's quintessential sci-fi classic, the 1956 Invasion of the Body Snatchers, is one of those films that once viewed, will not be forgotten. With ties to the real world, and politics galore, it's up there with the sci-fi greats. There were about twenty films that used variants of the process, inclusive of the least likely, Olivier's King Henry the Fifth (1945, three-strip Technicolor, 1.37). Olive's new Signature Edition release, is more about extras than the feature, which looks as nice as it possibly might. But it's those extras which push this Olive edition into Criterion turf. I’m a bit confused. Is this version 1:85 or 2:1? 2:1 , the materials needed to go back and create a 1.85 version no longer exist. I asked because in another thread the poster said it was 1:85 but preferred the 1:66 version. I think that was for Some Like It Hot. No evidence of their extinction, only their present state of being unknown. OK, to be more exact: they may exist but no one has been able to locate them. For decades. And when something DOES exist – the Perspecta track – they cheap out and leave it off. Just to be very clear, this is off the same exact element as before so other than authoring (more bits or bytes or whatever) it's basically the same. Yeah, we know that based on posted reviews. I have this on order, and am looking forward to going through all the extras. I am a bit ticked off about the missing Perspecta track, though. Oh, I know Perspecta was only "fake" stereo, but still it would have been nice to hear it. I also agree that the 3.0 Perspecta audio should have been inlcuded. In fact the release choild have been pushed back to include it. On the other Invasion thread, Bob Furmanek says Paramount has the restored stereo Perspecta track. So RAH says it’s not included on this disc? 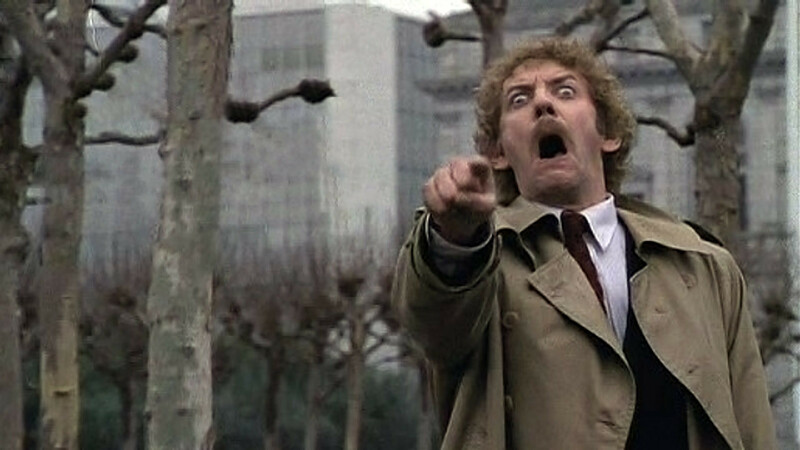 This is the definitive Invasion of the Body Snatchers as another member mentioned and I agree. The 1978 version is pretty good though and creepy. I know this will seem like sacrilege to most – but I've always preferred the '78 to the original. Apologies in advance. Don't hate me for it. "Don't hate me because I'm beautiful, hate me because I've got beautiful hair". Funny…I remember that commercial. There was also another one, I think it was for Pantine Pro shampoo where a Euro-super model turned to the camera with a pout and said "Your hair is not like a gown you can wear once and throw away….a-no!" Yeah, like anybody outside of the super model and Hollywood community does that either. Anyway, thanks for the laugh. He’s over here! He’s over here! Deep Discount is running a 15% off sale so I was able to get this title for $18.69 along with "The Curse of the Cat People" and "Winchester" at discounted pricing so I can get free shipping. I ordered this along with a few other titles in the sale. Disappointed to see that DD and ImportCDs are now adding 20% VAT (UK sales tax). I believe it's a remaster of the previous transfer at much higher bit rate. Captures at DVDbeaver look a shade brighter than the previous Olive. Yes, the S.E. looks darker, thanks for the correction! I think I like them equally…they are both consummate paranoia thrillers. Both films gradually develop a pervasive sense of dread and give us no easy outs (the coda that the studio grafted onto the '56 version does not definitively point toward a "happy" ending). Both are well acted. Both have gorgeous women in leading roles. They'd make a fine double-feature, because each is just different enough in structure, specific details and overall atmosphere so that whichever version you choose to run last will not seem redundant. The Free title is the lesser priced of a pair. If you have 2 at ~$27 and 2 at @~20 you'll get $40 off so pair wisely and make multiple orders as applicable to maximize your savings. Thanks Howie! I was able to pick up this and another Olive Signature title I've been wanting, Father Goosem for $14 a pop. Appreciate the info! I'm trying to decide between Father Goose or Operation Petticoat to pair with it – and am leaning towards the later. Shouldn't that be "Goose 'em"? 😉 I laughed when I read that – especially considering the plot of that movie. Damn! I just got Body Snatchers from Amazon! Thanks for the heads up. I’ll look at other titles perhaps. After all this time we FINALLY found something we agree on! Who knew? They’re both great films – I’d say you can’t go wrong with either! I agree. I like Operation Petticoat just a bit better but already own the Olive DVD release of that one. Just trying to decide if that's "good enough" and upgrade my old DVD release of Father Goose instead. I just ordered IotBS and Operation Petticoat. OP was on back order. Will they hold shipping until OP is restocked? If they do, I won’t complain. Two good movies for $28 including $0 for tax and shipping. This still image without sound is still creepy as hell. I've never had them hold an order because part is OOS. They'll ship what's in stock now and the rest when stock arrives. Here's the fun part… if they consider IotBS to be the "free" title they likely won't charge you until OP ships. At least that's how I've had it done on a few B1G1 orders in the past where one title was OOS. That would be cool, but I like that an order of $28 qualifies for free shipping and won’t complain if they charge me for the in stock movie. Personally, I most prefer "Body Snatchers", the 1993 version starring Gabrielle Anwar (Burn Notice), Billy Wirth and Forest Whittaker.. Hey, even my favorite critic Roger Ebert thought it was superior to the previous versions. That is a surprisingly good version that I, too, enjoy. I prefer the 1956 film as it's the one I saw first and grew up with but the 1978 and 1993 versions are very much worth the time and each has a spot in my library. I watch them almost as regularly as the 1956 original. The only one I find a total waste of time is the 2007 film "Invasion." So IotBS has been done at least 4 times and at least 3 of them are good. Pretty good batting average. The preview is from the 1978 version. When I first saw the 1978 version I went in with a "A Remake of IotBS!?! How can they possibly outdo the original? It's a classic!" and came out with a "Wow! That was actually good!" It's one of the earliest remake movies I'd seen where I knew it was a remake up front and felt it wasn't a waste of time. I still liked the original better but this was worthy of regular viewings. Then at some point I read about Body Snatchers, the 1993 version, but didn't see any reviews. I just knew the film existed, was another remake, and it was on DVD. OK… I'm a fan of the movie, like both versions I'd seen, so let's get a copy of this one just because. I wasn't expecting much but it was another surprise in that it, too, was very good! Now I have 3 versions of the story in my library and watch them all fairly regularly, sometimes back-to-back just to observe the differences and similarities. Then along comes the 2007 film, The Invasion… I'm ready to give it the benefit of the doubt as the other 2 remakes have been excellent films. Wait… reviews aren't that positive. But they also weren't necessarily that good for the 1983 version so… I get a copy and watch it. What the heck did I just see?!? It sort of shares the main plot but not much else. It's a modern action/adventure movie with the generic theme grafted on so they can get the title and, by association, fill seats. Blech! I keep it because there are certain films for which I'll obtain a copy of every version available "just because" but I don't necessarily watch the "bad" versions unless someone else asks. Even then I attempt to dissuade them from the viewing. IIRC, I've watched this version twice and had pretty much the same reaction both times. My Signature Edition copy has shipped – or rather is "in shipping" as the USPS indicates it's "Currently awaiting the package." DD shipped IotBS and charged me for it…$14. So they’ll charge another $14 when OP ships. I think that’s fair. :thumbsup: To DD. More than one Amazon reviewer is complaining about the picture quality on this new release. Sigh. But based on what I've seen on this thread, I'm disregarding them and buying anyway. This has to be a step up from my Republic/Artisan DVD, no? I haven't seen it since it was first on DVD many years ago, but I remember liking The Invasion. Not as good as the others, but still a quality film. "It's a modern action/adventure movie with the generic theme grafted on so they can get the title and, by association, fill seats." It seems they didn't want the title, because it's different. How many casual viewers would associate it w/ the previous versions with this generic title? Love the first two. I saw the '78 version in the cinema when I was ten and it scared the hell out of me. The '93 take on the story, though, does nothing for me, largely because of a couple of downright bizarre storytelling choices. Making the protagonists strangers in a new place effectively nullifies the the entire idea that their friends and neighbours are no longer behaving like themselves. And this is further undercut by the army base setting, where you'd expect the inhabitants to display both extreme conformity and emotional reserve. I don’t under the negative comments. The picture quality on my 10.5 foot screen was great. Yes the main title is soft but the rest of the movie is sharp with great black levels etc. I also don’t have a problem with the packaging. My only complaint is that this and other Olive discs do not allow my player to stop and resume from the stopping point. Always have to start from the beginning and then fast forward to where I left off. My only complaint is that this and other Olive discs do not allow my player to stop and resume from the stopping point. Always have to start from the beginning and then fast forward to where I left off. It's not just Olive but quite a large portion of BR discs with me. I thought it was a player issue but research into this indicates it's an authoring choice. IMHO it's a bad choice. I don’t under the negative comments. The picture quality on my 10.5 foot screen was great. I was rather pleased with the slight upgrade in image quality over the older Blu-ray, and the Extras are very good. I liked it enough to order a 2nd copy to give to my son (rather than just pass along the old Blu-ray to him). It is interesting to see the old (rough but sharp image quality) tailer as an Extra on the new disc as it seems to be from the full frame. I thought this Signature release looked slightly better than the previous Olive BD release. It isn't a night and day difference, but it looks slightly better to me. I'm going to watch it again tomorrow, anybody have any suggestion as to which audio commentary I should listen to? I listened to both commentaries, and I really enjoyed the Richard Harlan Smith commentary – it was clear he was very, very prepared and knowledgeable, and he provided lots of interesting analyses and anecdotes. 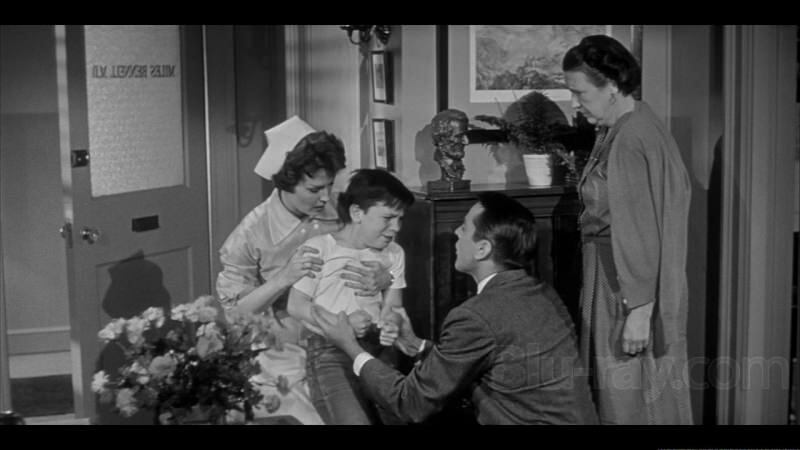 The Kevin McCarthy/Dana Wynter/Joe Dante commentary isn't bad, but it seemed a bit underwhelming. Wynter didn't really contribute very much (she admitted she had only seen the movie in its entirety once) and McCarthy tended to ramble a bit. I heard that a lot, the actors and the producers of the movies, don’t watch there own work after they’ve finished it. Another "problem" with this commentary (and it's nobody's fault, really) is that Invasion was made 50 years before they recorded the commentary, so probably neither McCarthy nor Wynter had total recall of the movie's production. There were a few moments where both of them were struggling to remember certain things or seemed uncertain about other things. Which is natural. I don't mean to denigrate their commentary too much, though – they were both very good-humored and both had an obvious affection for the movie, and Joe Dante did well as an enthusiastic moderator. But I think I learned more from the Richard Harlan Smith commentary – I especially liked his detailed comparisons of the movie and the novel. Thank you. I'm going to listen to both commentaries in due time, but I wanted to listen to one right now so I'll take your suggestion. Eventually, I will, but not today. The Olive Signature Blu-ray is on sale at Deep Discount today for $13.74.